You would definitely survive a zombie apocalypse,’ my friend Rich tells me as I wiggle out the axe I have just lobbed right into a bullseye of a target. I’ve come to a place called Whistle Punks to try out the latest going-out trend – urban axe throwing – which was recently made famous by Harry Styles. 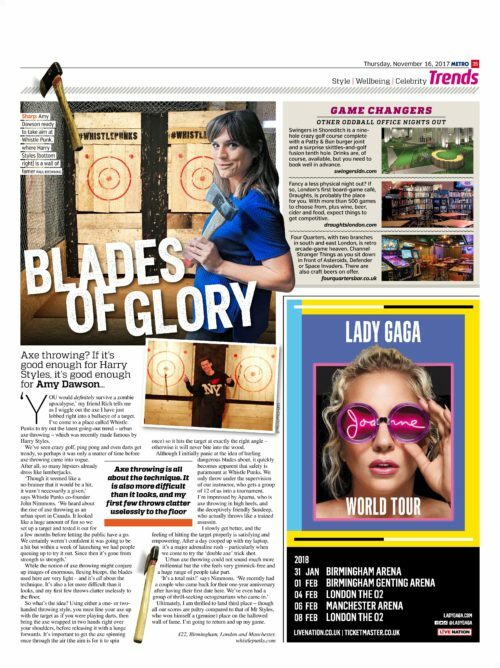 We’ve seen crazy golf, ping pong and even darts get trendy, so perhaps it was only a matter of time before axe throwing came into vogue. After all, so many hipsters already dress like lumberjacks. While the notion of axe throwing might conjure up images of enormous, flexing biceps, the blades used here are very light – and it’s all about the technique. It’s also a lot more difficult than it looks, and my first few throws clatter uselessly to the floor. So what’s the idea? using either a one- or two- handed throwing style, you must line your axe up with the target as if you were playing darts, then bring the axe wrapped in two hands right over your shoulders, before releasing it with a lunge forwards. It’s important to get the axe spinning once through the air (the aim is for it to spin once) so it hits the target at exactly the right angle – otherwise it will never bite into the wood. Although I initially panic at the idea of hurling dangerous blades about, it quickly becomes apparent that safety is paramount at Whistle Punks. We only throw under the supervision of our instructor, who gets a group of 12 of us into a tournament. I’m impressed by Aparna, who is axe throwing in high heels, and the deceptively friendly Sundeep, who actually throws like a trained assassin. I slowly get better, and the feeling of hitting the target properly is satisfying and empowering. After a day cooped up with my laptop, it’s a major adrenaline rush – particularly when we come to try the ‘double axe’ trick shot. Ultimately, I am thrilled to land third place – though all our scores are paltry compared to that of Mr Styles, who won himself a (genuine) place on the hallowed wall of fame. I’m going to return and up my game.